Laure Prouvost, This Means, 2019, mixed media, dimensions variable. In less than a decade, Laure Prouvost has distinguished herself by making witty and seductive works, often presented in the guise of complex and immersive installations that convert exhibition spaces into substructures. This could be seen in “Farfromwords: cars mirrors eat raspberries when swimming through the sun, to swallow sweet smells” (2013) at London’s Whitechapel Gallery, where she built a cylindrical environment paying sumptuous homage to Italian culture, and “GDM—Grand Dad Visitor’s Center” (2016–17) at Milan’s Pirelli HangarBicocca, where she devised a mini-museum dedicated to her grandfather. Such a practice, while not exactly site-specific, evidently responds to the hosting architecture by augmenting it and, in certain cases, confronting it. It was therefore legitimate to wonder how “AM-BIG-YOU-US LEGSICON,” the first museum show to offer a comprehensive overview of Prouvost’s work, would turn out. Surprisingly, the exhibition proves cohesive, with each segment, proposed anew by curator Nav Haq, successfully dialoguing while shrugging off chronological order. Equipped with a map reproducing the artist’s sketch of the building’s floor plan, visitors can roam around her Gesamtkunstwerk and dip into her extraordinarily rich conceptual vocabulary, which includes twentieth-century philosophy, psychoanalysis, deconstructions of language, and imagined and existing personal memories. 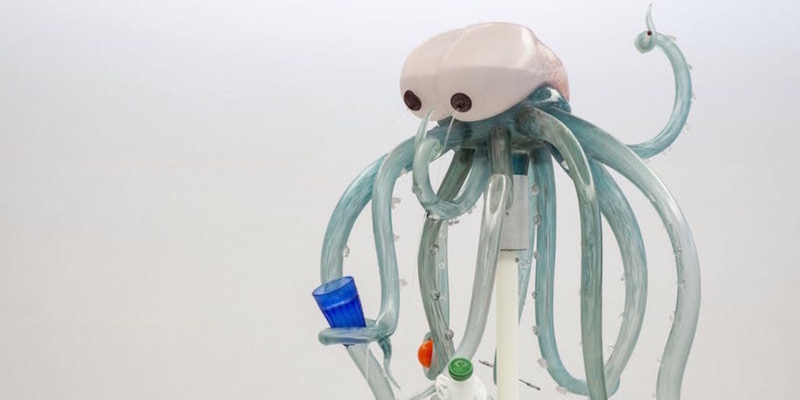 Emerging from this cacophony is Prouvost’s idiosyncratic sense of humor, most detectable in This Means, 2019, a new work consisting of an octopus-shaped fountain made of Murano glass and various found objects. Impishly and erroneously cited by the artist as having the oldest form of brain known to have existed on the planet and one with practically no memory, Prouvost’s octopus offers a poignant metaphor for the whole exhibition—engaging and dazing—while granting a sneak preview of the artist’s French pavilion at the Venice Biennale, where it has been announced that the mollusk will once again play a starring role.